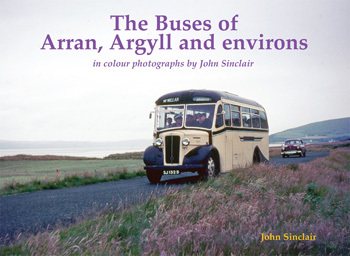 This latest selection of John Sinclair’s colour photographs covers the islands of Arran, Bute and Cumbrae, the old county of Argyll and a few places on the fringes of this area. Student John had built up a technique of low cost travel and accommodation to go to different areas and photograph the local buses operating in their habitat and in July 1965 the soon-to-be junior doctor went from his Edinburgh home to Argyll and the Clyde Coast. The majority of the photos in this book date from that trip with a few others from subsequent decades. Locations featured include Brodick, Whiting Bay, Ardrossan, Millport, Ardbeg, Balloch, Balmaha, Inveraray, Lochgilphead and more.